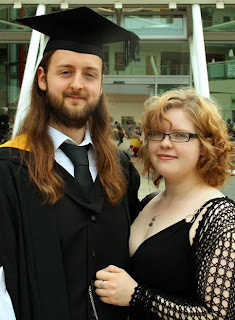 On Tuesday I graduated from the University of Bradford (UK) as a Bachelor of Science in Computer Animation and Special Effects with a First Class Honours. Bit of a mouthful! Anyway, it was lots of fun. I got to see some family and all of my friends and fellow students again. Hopefully not the last time. So that means I'm not longer a student, I'm a graduate and right now I should be really pushing to get into the industry. Which I am having a good go at. I'm completely aware that these things take time, sometimes months even for the best animators. I'm going to keep on animating new things that I haven't done before to stick into my showreel. The mini-challenges over at the 11 Second Club are proving to be great exercises! I received some great crits about my current showreel from a friend at Blitz Games Studios (who I need to reply to). He recommended that I animate and include in my showreel more larger action shots like physical lifting, a jump and maybe a run. I'll be working on getting all of these and hopefully more done. Congratulations to everyone who graduated on the day!